A definition of the word "quilt" found in the Oxford University Press says this: "A warm bed covering made of padding enclosed between layers of fabric and kept in place by lines of decorative stitching." But if you’ve ever held an old handmade quilt in your hands and examined it closely, I believe you’ll agree that one word is missing from the definition found in the Oxford University Press version, and that word is "lovingly." That definition should read "A warm bed covering lovingly made ..." It’s my opinion that one of the main ingredients found in antique quilts is love. I bought an old quilt at an auction a couple of summers ago, and on the back of the quilt, the name "Lillie" was embroidered. The story I heard the day of that auction was that the folks whose belongings were being sold had many years ago lost everything they owned in a fire, and the ladies who were friends and neighbors each made a quilt for the family whose house burned. The name of the person who made a quilt was hand stitched somewhere on each quilt. To me, that’s a good example of showing love for a neighbor. When I was growing up, I can remember my grandmother Ninnie McCormick having an all day quilting session in the living room of my grandparents home on Hillview Drive. The quilt racks were hung from the ceiling, and lots of my grandmother’s lady friends, neighbors and relatives would come and help with the quilting. A covered dish dinner was also shared at these special times. Alene Gabbard Savage told me each time the ladies in her neighborhood in the Heard Ridge community of Pickett County where she grew up finished a quilt and it was ready to be taken out of the quilting frames, a young, unmarried person was picked to stand at each corner of the quilt. A cat was then brought in and placed on the quilt, and whichever corner the cat ran to in order to jump off the quilt, that was the next person who would get married. Days such as these are just memories now. It’s sad to say, but they no longer exist. If only these quilts that help connect us to the past could somehow share with us how they each came into existence, what wonderful stories they could tell. This is certainly true with a quilt Ronald Dishman was lucky enough to become the owner of. It’s origins can be traced back to the Taylors Crossroads Community, and the story of this quilt has been pieced together like this: There was once a Presbyterian church and a Methodist church located right in the middle of Taylors Crossroads. The building where the Methodist church held services still stands today, but it hasn’t been used for church services for a long, long time. Mr. and Mrs. George Taylor donated the land where each church was located. I was told the two churches, one known as the Taylors Crossroads Presbyterian, and the other as the Taylors Crossroads Methodist church, were both built around the same time, and the buildings were similarly constructed. The Presbyterian church at Alpine was the mother church for the Taylors Crossroads Presbyterian church. The minister, Dr. J. H. Miller, who served at the Alpine church also held services at the one in Taylors Crossroads. 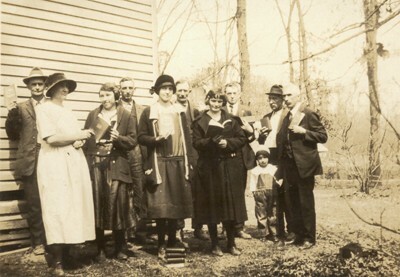 This photograph was taken of a Sunday School class standing outside Taylor's Crossroads Presbyterian Church around 1925. Pictured are: front from from left - Minnie Smith, Lucy Adkins, Gladys Worley Dennis, Mabel Worley Conner, Shirley Smith (the small boy), Dr. J. H. Miller of Alpine. Back row, Jasper Worley, Joe D. Deck, Mike Dennis, an unidentified man believed to be someone who accompanied Dr. Miller from Alpine, and George Smith. In order to raise funds for the Presbyterian church, as best can be determined, the ladies of the community helped to make a quilt that was sold at an auction or maybe a pie supper. It is estimated that the quilt was made in the late 1920's or possibly the early 1930's. Sixty-three (63) names have been embroidered on the quilt. Some of those are only initials, and some had only first names followed by a capital letter that stood for that person’s last name. 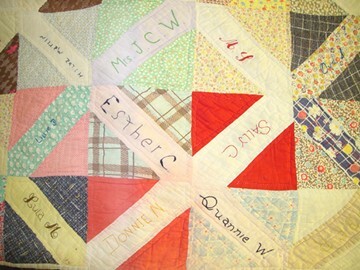 A young girl’s name was often included on the quilt by her mother. The names that have been identified are as follows: Donie Sells; Ada Belle Leach; Mrs. Arvil Reagan; Beulah Daniels; Delcie Smith (sister of Ruby and Jewell); Mrs. Benjamin Franklin Reagan (Webbie Nation Reagan); Ella Taylor; Ova Sells; Ruth Dennis; Mrs. I.B. Martin; Alice Conner; Fannie Conner; Ardith Brown; Fay Smith; Mabel Mullins; Sally Conner; Quannie Worley; Donnie Nation; Esther Culbertson; Mrs. J.C. Worley; Inez Maynord; Ellen Holt; Clarice Keisling; Jewell Smith; Mrs. Toy Daniels; Nova Holman; Hilda Martin; Lillie Daniels; Lula Maynard; Lola Smith; Alene Reagan; Audra Holman; Etta Ramsey; Bonnie Sells; Agnes Vaughn; Ethel Mae Sells; Veleria Smith; Homer Sells; Anna Mae Bilbrey; Arzie Richardson; Vella Garner; Mrs. Alfred Allred; Lucille Holt; Pauline Roberts; Bonza Daniels; Callie Nation; Ruby Smith; Katherine Sells; Marie Sells; Alva Reagan; Mrs. Rebecca Holman; Lilly Holt; Mertie Gore; Mrs. Raymon Bilbrey; Martha Conner. Those unidentified names or initials are: Magdalene G.; May S.; Claudine S.; M.Y. ; F.E.S. ; J.H. Clark; Betty B.; and H. Clark. The quilt is remarkably good shape to be as old as it is. The reason for its preserved state is that for many years, it had been stored in box at the bottom of an old trunk in the upstairs of the home Emmet and Hettie Keisling located in the Hatcher Hall community. 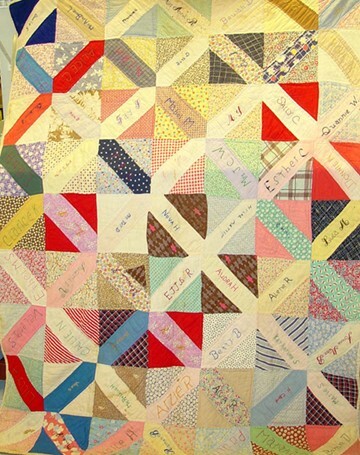 It is believed that Emmet Keisling was the lucky person to win the quilt when it was sold at the fund raising event for the Taylors Crossroads Presbyterian church. Eventually the quilt, like so many today, ended up being auctioned off when the personal belongings of Hettie Keisling were sold. Even though I lived in the Taylors Crossroads community for many years, I had no idea there was ever a Presbyterian church there. As part of my research for this story, I was invited to visit in the home of Quannie Garrett, an aunt of Ronald Dishman. Quannie’s parents, Jasper and Louella (Ellie) Worley, were active members of this church, and it was because of their hard work and support of the church that Quannie ended up with the very large Bible that was used in the worship service of the Presbyterian church. Ronald did some research about the Bible and has determined that more than likely, it was published in the early 1800's. I have never seen a Bible like this one before, and just out of curiosity, those visiting with Quannie the day I was there to talk with her about this story decided we should determine just how much this Bible weighs. Bathroom scales were used, and the answer was almost 30 pounds. Quannie told me how the Bible somehow survived being abandoned in the Presbyterian church building after lack of attendance made closing the church necessary. Eventually those who attended the Presbyterian church merged with the Taylors Crossroads Methodist church, and the Bible found a new home. Services were eventually discontinued at the Taylors Crossroads Methodist church, and many of the members then began attending Martin’s Chapel Methodist in the Oakley community. The Bible was again abandoned and left in Methodist building at Taylors Crossroads for a time. But one of the members, Lois Ferrell, remembered how Quannie’s parents had supported the Presbyterian church through their hard work, and brought the Bible to her to keep. George Roberts bought the property on which the Presbyterian church stood, and even though he tore the old church building down, the lumber was not destroyed. He used it to build the house he and his wife, Alva, lived in for many years, and today is occupied by his son, Ronald, his wife, Delberta, and Ronald’s brother, Dale Roberts. Even though those days are just memories now, the evidence of the good times shared in the making of the Taylors Crossroads quilt that helped to raise money for a little country church can be appreciated through Ronald’s quilt. It’s very fitting that he should now be the owner since 14 of his relatives helped with the making of the quilt. And understandably so, it’s one of his most prized possessions. The quilt featuring the 63 names of the women who pieced it for a church fundraiser has been very well preserved over the years.